Marvin Gaye and Tammi Terrell sang, “Ain’t no river wide enough to keep me from getting to you.” Well, it’s not a river, but Tim and I do have the English Channel (and then all of France) between our respective homes. Thankfully, there’s a lot of easy ways to cross the English Channel from planes to the Brittany ferries. And the upside of making many, many trips back and forth is exploring pretty much anywhere from the north west to the south west of France. The Norman port town of Honfleur is just a 30-minute drive from the port in Le Havre, and an excellent jumping off point for exploring Normandy. Not to mention that Honfleur is one of France’s prettiest little towns. Just exactly what is there to do aside from whiling away the hours sipping calvados on the quay? 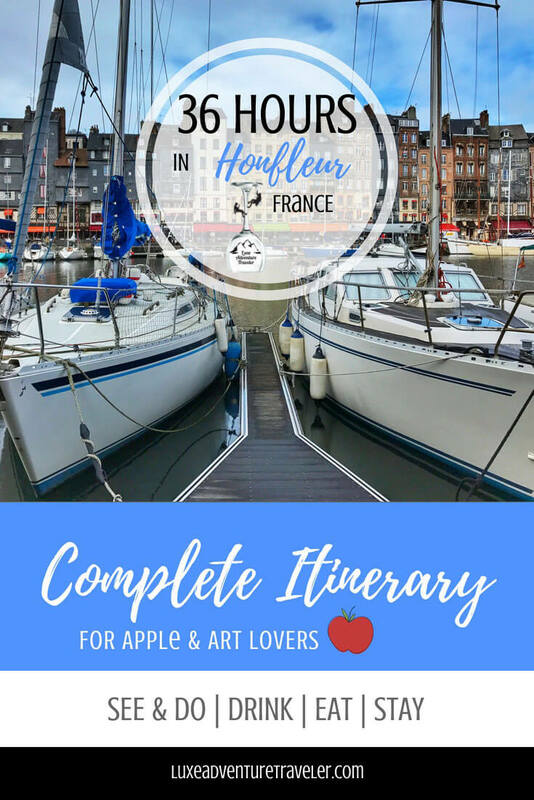 There’s actually plenty of things to do in Honfleur, making this a perfect little spot for a 36 hour stop over or a short getaway. Fresh off the overnight car ferry from Portsmouth, the best way to start your visit to Honfleur is fueling up with a coffee and a pastry. La Petit Chine is one of Honfleur’s best tea salons with homemade pastries. Housed in a typical Norman house, the tea salon has a fantastic view of the Vieux Bassin. It’s fitting to begin a visit to Honfleur with a stroll around the colorful Vieux Bassin. The 17th century port is Honfleur’s main attraction with the picturesque narrow slate-roof timber houses lining the Quai Sainte-Catherine. If the port feels a bit familiar, it may just be that you’ve seen it before…in paintings by the famous Impressionists like Eugène Boudin and Claude Monet. Boudin was born in Honfleur in 1824 and he was the first landscape painter to work en plein air, or outside. He befriended a then 18 year old Claude Monet in the 1850s and it was Boudin that encouraged Monet to try his hand at landscapes. Like Boudin had always been, Monet too soon fell in love with Honfleur. With Monet’s artist friends like Renoir, Jongkind and Courbet, the Ecole d’Honfleur was formed and the Impressionist movement took off. Honfleur, immortalized by artistic brush strokes, became famous. It’s obvious why the Impressionists loved painting this spot. But something far less obvious is the odd stone building at the end of the port that just doesn’t seem to fit with the rest of Vieux Bassin. It’s called la Lieutenance and it’s the only remnant from when Honfleur was a medieval fortress. If you’re visiting on a Wednesday or Saturday, there’s also a farmers market that stretches out from behind the old church to the harbor. Like with all French markets, you’ll find local producers of cheese, calvados, ciders and the fresh catch that the fisherman have brought in that morning. While Normandy is primarily on the radar of history buffs wanting to visit the D-Day beaches and combat sites, this region is also known for the cultivation of apples. The apples are then turned into rustic ciders and calvados (an apple brandy). With Britain just a short distance across the English Channel, you’d think it was the Brits that brought cider to Normandy. But it was actually Charlemagne, who had encountered sydre in the French Basque country and liked it so much that he imported the cultivation of apples to Normandy in the 9th century. Today Normandy has more than 700 apple varieties and 50 alone are just for producing cider. If you have time, you can traverse the 40-kilometer long Cider Route to taste at cider and calvados producers’ distilleries in the Pays d’Auge. If you’re more pressed for time, head to La Cidrerie. Do as the Normans do, grab a seat at one of the long wooden tables and taste your way through the selection of apple and pear ciders and calvados from Normandy. The crêpes (sweet) and galettes (savory) are also excellent and make a good choice for a light lunch. Almost never ones to visit most museums, you know it’s a lovely museum if we tell you to go. Spend about an hour after the Musée Eugène Boudin re-opens after lunch to admire not only the collection of paintings and sketches by Boudin, but other works from Monet, Courbet and other Impressionists. You’ll spot the famous Vieux Bassin that you’ve already strolled around, as well as other scenes from around Honfleur you’ll soon discover. After the museum, slowly make your way through town to La Ferme Saint Simeon, where you’ll relax for the rest of the evening. The ancient Norman farm was once a 17th-century leper colony, then a type of traveler’s hostel for artists, before becoming the luxury 5-star hotel and spa that it is today. Monet even stayed here, once paying just 40 French francs for a month’s rent (about the equivalent of $265 US today). The on-site spa is the perfect place to relax the rest of the afternoon away. There’s an indoor pool, jacuzzi, sauna and steam room for guest use. The spa menu also includes treatments using Norman apples, like the signature apple massage with apple seed oil. Normal apples have detoxifying and antioxidant properties, not to mention smell amazing. With fertile green pastures and kilometers of coastline, Norman cuisine boasts both some of the top meat and seafood to be found in France. If you’re visiting between fall and spring, don’t miss out on enjoying some scallops. Between 50-75% of the scallops fished in France come from Normandy and scallop fisihing is regulated to the months from October to May. 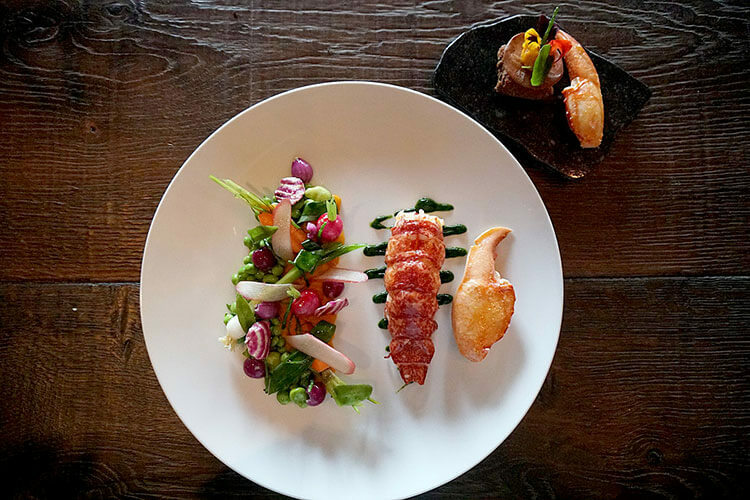 The blue Breton lobster also graces quite a few Norman menus. It’s a type of European lobster different from the Maine lobsters we know in the US, and though much more expensive than Maine lobsters, should definitely be tasted at least once. Lamb is another specialty for the meat and potatoes types. The gourmet restaurant La Ferme Saint Simèon is truly exceptional. There’s really no reason to venture back out for dinner when the restaurant has a charming ambiance and a delicious menu that showcases the best seasonal Norman cuisine. NaturoSpace shouldn’t be missed when visiting Honfleur. 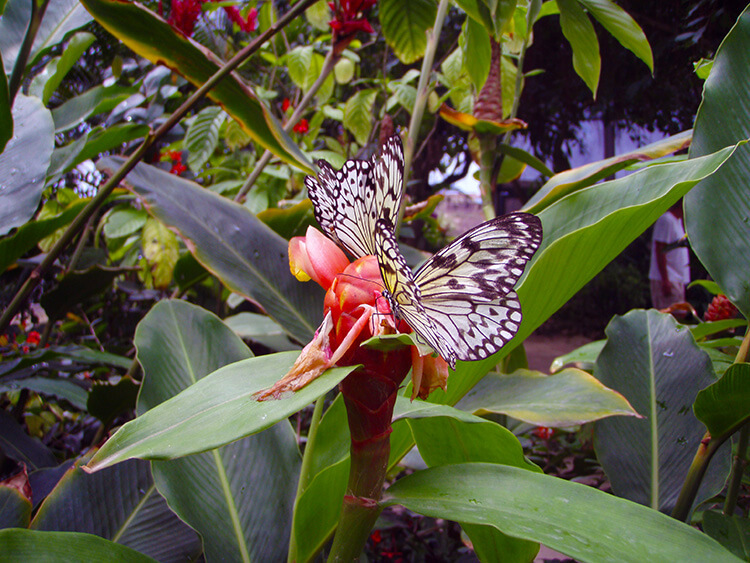 It’s more than butterflies, but is also known as the Butterfly House. This 11,000 square foot site is a photographers dream with free-flying birds and butterflies, and plant and floral species inside the magnificent greenhouse. I used to collect butterflies and moths as a kid. Depending on the species, they only live from 1 week up to a few months. My parents’ house in the countryside was a goldmine for finding butterflies and moths that had just passed on. So being surrounded with the different butterflies from three major tropical areas of the world fluttering about was a beautiful way to spend a morning. And if you visit from May to September, there’s quite a lot of caterpillars in addition to the butterflies. There’s also an impressive collection of thousands of rare plants and flowers, which play a vital role to the butterflies. You can easily spend a few hours observing the birds and butterflies flying about. 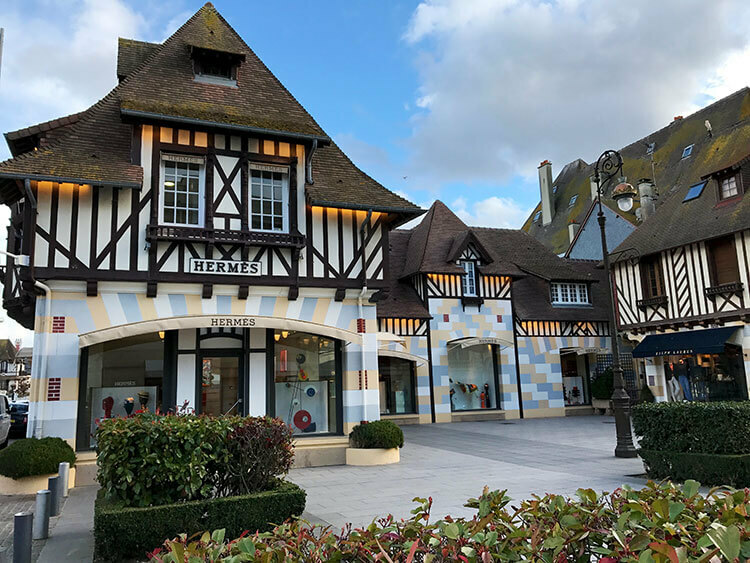 Just about 30 minutes drive from Honfleur, Deauville is known around the world. 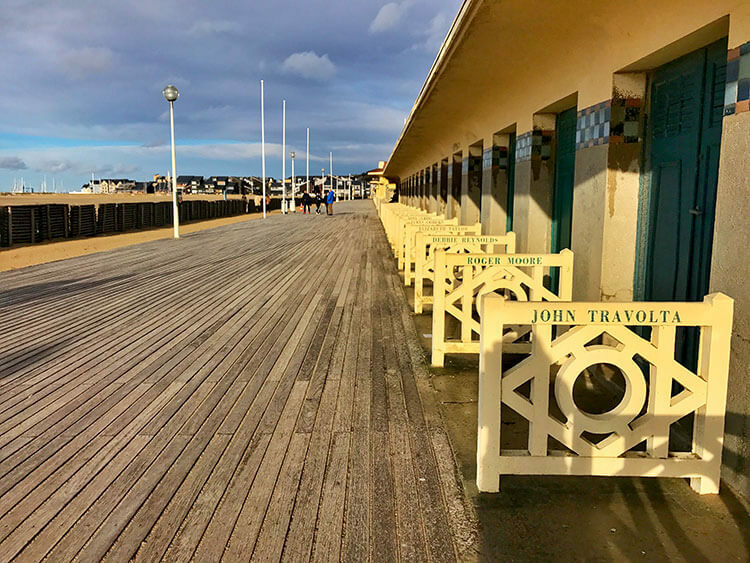 Spend a few hours wandering more than 500 historically listed buildings in the town, beach combing the sweeping expanse of white sand beach, or trying your luck at the sophisticated Casino Barrière Deauville. Made famous by the high-society actors and actresses that have graced the town and beach with their visits, Deauville hosts an annual American film festival. The famous 1.5 kilometer long wooden boardwalk with bathing cabins is decorated with the names of American actors like Harrison Ford, Clint Eastwood, John Travolta and others that have all attended the film festival. At low-tide, thousands of shells and razor clams are uncovered along the beach. Kite surfers put on an impressive show with their flips and tricks. And, if you’re lucky, you might spot some of Deauville’s renowned race horses that train on the beach. A charming town with luxury shops like Louis Vuitton and Hermès housed in belle epoque and half-timbered buildings flanks the long stretch of beach. There’s more than 550 buildings in Deauville that have been listed as historical monuments, and each is seemingly more photogenic than the last. If you’re looking for a bite to eat, try the moules frites at Week-End. Plentiful and inexpensive, they’re some of the best moules frites we’ve had. Not surprising really, since more than 30% of the mussels produced in France come from Normandy. Just a 10-minute walk from the center of Honfleur, La Ferme Saint Simèon is easily Honfluer’s best hotel. The 5-star hotel was once the Inn of Mère Toutain and was frequented by artists like Monet, Cals, Sisley, and Courbet. Some of the most important events of the Impressionist movement took place at La Ferme Saint Simèon. The property eventually became the boutique luxury hotel that we see today, but the charm and character that inspired some of the world’s most famous artists has been preserved. There’s the thatched roof timber buildings planted with the irises, that for practical purposes make them waterproof, and are a sight to behold when the irises bloom in spring. There’s the old cider press near the entrance, paying homage to the long tradition of cider making in the Pays d’Auge. There’s the apple orchard, which come fall is the picture-perfect scene of Pays d’Auge. The guest rooms are divided between the main building, where the authenticity of this Norman house has been maintained. There’s the original half-timbers and wooden staircase leading to the guest rooms. A more modern addition with elevator was added across the garden and houses the spa and pool. No matter which building the guest rooms are in, each are uniquely decorated and all either look out on to the flower gardens or a view of the Seine and its estuary. Brittany Ferries operates a car ferry from Portsmouth to Le Havre, then Honfleur is about a 30 minute drive. Stay at the 5-star La Ferme Saint Simèon, just a 10-minute walk from the center of Honfleur. There’s parking on site, two restaurants, a spa and pool. So funny because I was trying to think of the name of this town the other day and just couldn’t remember it! We were there a couple of years ago and loved it, and your photos bring back so many great memories. I’m sorry we missed the Butterfly House – it looks beautiful. Glad we could help you remember, Lois! That’s too funny. We certainly loved our time in Honfleur just enjoying the harbour while we had our coffee and pastry. We certainly did understand why the Impressionists painted it. I am sorry that we missed the Musee Eugene Boudin. I actually did not know about the apple cider or calvados. We were too focused on wine in the region. But an apple massage may be something I would want to try. I will definitely keep this post for our next visit to the north of France. How was the wine? 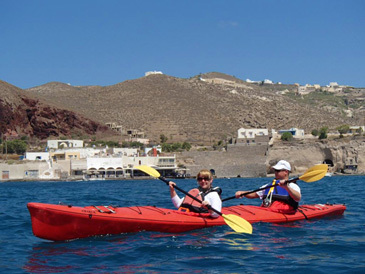 Was it Arpents du Soleil that you visited? Normandy definitely is not known for wine and there’s only a small smattering of wine growers. 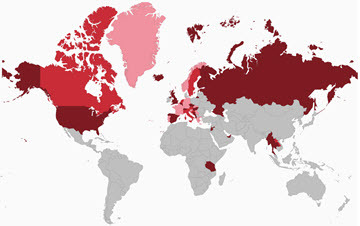 Normandy and Brittany are the only regions that have no commercial wine production activities in all of France! The grapes just don’t do well in the cold climate. Honfleur is a beautiful town, I had no idea Monet was from there! It has kept a lot of the quaintness you might expect from a little French village, I love it! What a picturesque town to visit! Thanks for bringing up the Cider Route – I would love to do a trip just for that! And that apple massage sounds super interesting! Honfleur seems so beautiful. At D-Day-1 it’s a very apropo post. My grandfather jumped with the 101st on D-Day. He was capture on Day 0 and spent the rest of the war in a POW camp. It’s so incredible seeing an area that’s so tightly linked to my personal history. Honfleur is such a beautiful town. It looks like you lived a dream there. France never fails to surprise with its little known or unknown gems. Honfleur is one of those shining jewels. What a nice place to spend the day. I was really impressed Vieux Bassine which was a favourite with the impressionist painters. Looking at the picture, I can understand why this must have been their favourite subject. Hope to get to this dreamland someday. Currently our France explorations have been confined only to mainstream Paris. What a cute town to spend a weekend! I especially love the port. And the fact that crepes are big there makes it perfect as well. I could spend the day wandering and looking at the colorful houses while nibbling on a sweet crepe! I must say Honfleur is exceptionally beautiful especially that house with thatched roof and bloom on it, just amazing. Your pictures are dreamy girl, I am adding this to our bucket list. Hopefully soon.